Your League: The ARRL Centennial QSO Party Starts January 1, 2014! With the end of the partial government shutdown, the ARRL VEC has begun sending test files to the FCC to determine whether their servers are ready to accept the large number of forms in the VEC queue. "We submitted two test license data files this morning and those have gone through the FCC system without a hitch," said ARRL VEC Manager Maria Somma, AB1FM. "Over the next day or so we will submit the backlog of files to FCC in batches of 50 to 100. We don't want to overload their system." Somma anticipates they'll be fully caught up by late Friday afternoon. "We have approximately 250 sessions and over 1500 forms in the queue," she explained. "We are also registering future exam session dates and receiving completed exam sessions in the mail." Beyond that, Somma says, "day-to-day operations at the ARRL VEC office are running smoothly despite this unusual event." Somma said most ARRL VEC exam sessions took place as scheduled, but a few sessions that were supposed to be held at government facilities such Army National Guard buildings, had to be cancelled or moved to different locations. The ARRL does not expect the Commission to immediately start granting any Amateur Radio-related applications, since it will take some time to ramp up operations in the wake of the shutdown. The ARRL Executive Committee has authorized ARRL General Counsel Chris Imlay, W3KD, to file a Petition for Rule Making on the League's behalf calling for the deletion of symbol rate references for data emissions in the HF bands. The EC met October 5 in Aurora, Colorado. The League's Petition, still in the final stages of preparation, would substitute an authorized bandwidth of 2.8 kHz for all data emissions in the bands below 30 MHz. Current FCC rules limit data emissions to a symbol rate of 300 baud below 28 MHz and to 1200 baud on 10 meters. The current limits date to 1980, when US amateurs first were authorized to use ASCII, reflecting the state of the art back then, which, the League points out, has been overtaken by technology. After discussing alternatives to the 2.8 kHz limit, the EC okayed filing the petition as drafted, subject to any final editorial changes. At its July meeting, the ARRL Board of Directors, on the recommendation of the Ad Hoc Symbol Rate Rule Modernization Committee, directed Imlay to draft a Petition for Rule Making with the FCC seeking to modify §97.307(f) of the Amateur Service rules to delete all references to symbol rate. The Petition would ask the FCC "to apply to all amateur data emissions below 29.7 MHz the existing bandwidth limit, per §97.303(h), of 2.8 kHz." In digital systems "symbol rate" refers to the number of times per second that a change of state occurs. The ARRL chose the 2.8 kHz bandwidth, since the FCC already has applied it to emissions on the channelized 60 meter band and because it's slightly wider than the data mode bandwidths currently in use by amateurs on HF. The Ad Hoc Committee had determined that the current symbol rate restrictions in §97.307(f) "no longer reflect the state of the art of digital telecommunications technology," and that the proposed rule change would "encourage both flexibility and efficiency in the employment of digital emissions by amateur stations." ARRL Chief Executive Officer David Sumner, K1ZZ, discussed the symbol rate issue in detail in his September 2013 QST "It Seems to Us" editorial. "The guiding principle for our use of the spectrum allocations to the Amateur Radio Service is cooperation in the sharing of access to a limited resource," Sumner wrote. On another FCC-related matter, Imlay noted that the FCC has yet to take action in ET Docket 12-338 to formally reflect the Final Acts of the 2007 World Radiocommunication Conference in its rules. Comment deadlines were more than 6 months ago. The Commission also has taken no action on the ARRL's November 2012 petition to implement a 472-479 kHz allocation, which stemmed from WRC 2012. Imlay said the subject may be considered in a Further Notice of Proposed Rule Making in the proceeding. Imlay told the EC that FCC action is expected soon on WT Docket 12-283 and WT Docket 90-209, which contain several proposals to amend rules governing the administration of Amateur Radio examinations. The League has argued against a proposal to reduce the number of volunteer examiners required at an exam session from three to two. The EC reviewed a draft FCC filing prepared by ARRL Chief Technology Officer Brennan Price, N4QX, that supports recommendations approved last month by the FCC Advisory Committee for World Radiocommunication Conference 2015. The EC authorized Price to file the comments, subject to any final editorial changes. As part of its 2014 centennial celebration, the ARRL has designated six major ham radio gatherings as "Regional ARRL Centennial Events." The action was approved October 5 when the ARRL Executive Committee met in Colorado. ARRL Marketing Manager Bob Inderbitzen developed a proposal for the concept as a way to, in effect, take the ARRL Centennial celebration to more radio amateurs across the US. "While ARRL has planned a premier national-level Centennial Convention for 2014 in Connecticut, organizing some regional events will encourage greater awareness for the anniversary and greater participation by members, for whom traveling to New England will be too far, too costly, or otherwise not practical," Inderbitzen suggested in his proposal to the EC. The centerpiece of the League's centennial is the 2014 ARRL National Centennial Convention in Hartford, Connecticut, July 17-19. EC members approved six Regional Centennial Events to complement the National Convention. In addition to encouraging greater awareness of the ARRL's 100th anniversary celebration, sanctioning the regional centennial events is aimed at enhancing the all-volunteer ARRL Field Organization, generating greater interest in League membership, program, services and publications, and helping to promote the ARRL's Second Century Campaign. In conjunction with the 100th anniversary of the ARRL, the ARRL Centennial QSO Party is set to kick off January 1 for a year-long operating event in which participants can accumulate points and win awards, as well as working new stations and making new friends. During 2014 W1AW will be on the air from every state (at least twice) and most US territories, and it will be easy to work all states solely by contacting W1AW portable operations. This marks the first ARRL-sponsored operating event where every member is worth at least one point. The event is open to all, although only ARRL members and appointees, elected officials, HQ staff and W1AW are worth points. Working ARRL's president, for example, earns 300 points! cross-mode contacts), using CW, phone (FM, SSB, AM, digital voice), digital (any digital mode, such as PSK31, RTTY) on 160, 80, 40, 30, 20, 17, 15, 12, 10, 6, 2 and 1.25 meters, plus 70 centimeters and satellite. Stations exchange signal report and ARRL abbreviation. Contacts do not have to be contest-style and it isn't necessary to give the ARRL organizational information. A centennial database will assign point values to all logs submitted electronically. Those not submitting electronically, however, will need to obtain the QSO information during the contact. This event is not a contest, so participants may make contacts in any fashion they prefer. Work W1AW operating portable from all 50 states. Working W1AW in Connecticut does not count for Connecticut, however. Participants can earn W1AW Connecticut credit only for working W1AW/1 in Connecticut. A W1AW WAS certificate and plaque will be available (pricing not yet announced). For an extra challenge, work all 100 W1AW portable operations -- essentially a double WAS with W1AW! Club call signs do not count for points. 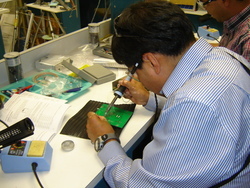 Repeater contacts are not valid for credit. Mobile and portable operations are okay but do not count for points in addition to home operation -- ie, a contact with KØGW counts for KØGW, whether it is made with KØGW/4, KØGW/m, or PJ4/KØGW. Stations outside of the US may also count for points. More than 10,000 ARRL members live outside the US, and some of these are also volunteer examiners or DXCC card checkers. ARRL appointees, staffers, and officers should choose for their contact exchange the appointment or office held that offers the highest point value (this is how the database will work also). For example, KI9XX is an ARRL Life Member (a LM is worth 2 points), a Volunteer Examiner (VE is worth 5 points) and a State Government Liaison (SGL is worth 30 points), so KI9XX should use "SGL," since that offers the highest point value. In any event, the database will give credit for the proper point value. The top-scoring operator from each ARRL Section, Canadian Province and DXCC entity will receive a First Place certificate. The Top Five overall point scorers will receive awards. There is a charge for award certificates. For complete information, visit the ARRL Centennial QSO Party web page. Contact us if you have questions. Teams of radio amateurs have responded to assist in the aftermath of powerful Cyclone Phailin, which came ashore at Odisha and Andhra Pradesh in the Bay of Bengal. The storm forced some 500,000 residents to evacuate ahead of the storm, which flooded thousands of homes. Jayu Bhide, VU2JAU, has asked other operators to keep 7145 kHz clear for disaster-related traffic. He says VU2DPI, VU3BHI, and VU2AOR are among the responders. "It is raining heavily," Jayu said October 13, "but so far no casualty was recorded. Earlier they had six swept into the water. The rescue work is in progress and not affected by rains." The latest death toll is 21. 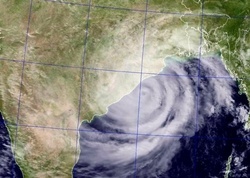 The cyclone affected a 150 kilometer stretch of coastline. Relief efforts were underway, with displaced residents being fed and housed in shelters. Many mud homes and farms were destroyed, and uprooted trees blocked roads, and windy and wet conditions remain in some areas. 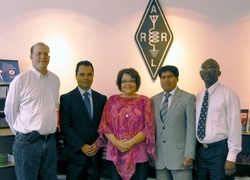 Students from the Caribbean and South America attended the 30th United States Telecommunications Training Institute (USTTI) Amateur Radio Administration Course (ARAC) September 30-October 4 at ARRL Headquarters. ARRL Chief Technology Officer Brennan Price, N4QX, coordinated the session and administered the course, designed for government officials in developing countries who regulate and manage Amateur Radio. ARRL Assistant to the Chief Executive Officer and Meeting Planner Lisa Kustosik, KA1UFZ, coordinated the League's participation with USTTI and hosted the students. Those taking part in the program work in their respective government's telecommunication offices, where they have responsibilities for Amateur Radio licensing and regulation as well as preparation for international conferences. "Our students -- Ishmael Cadogan, 8P6PE, from Barbados and Dorian Angulo and Franklin Palate, both from Ecuador -- made the trek to Newington this year," said Price. "All three students were experienced regulators, and in Mr. Cadogan's case, an experienced radio amateur," Price added. "All were already quite knowledgeable about Amateur Radio, and left with a deeper understanding of the unique nature of the Amateur Radio Service." ARRL staff members delivered classroom presentations within their areas of expertise. Emergency Preparedness Manager Mike Corey, KI1U, taught a unit on Amateur Radio's emergency communication capabilities, while QST Editor Steve Ford, WB8IMY, covered digital communication and Amateur Radio satellites. ARRL Regulatory Information Manager Dan Henderson, N1ND, discussed licensing, examination and regulatory issues. Laboratory Engineer Bob Allison, WB1GCM, supervised each student's successful assembly of a 40 meter receiver kit, that each student got to take home. The 31st Annual AMSAT Space Symposium and Annual Meeting November 1-3 in Houston -- home of Johnson Space Center -- will highlight the 30th anniversary of Amateur Radio's involvement in human spaceflight and the evolution of Amateur Radio into a successful program aboard the International Space Station. Forums during the event will focus on various aspects of Amateur Radio in space, satellites and satellite-related technology. Amateur Radio on the International Space Station (ARISS) is an international educational outreach that provides opportunities for students to chat with astronauts and cosmonauts aboard the ISS via ham radio. The recent delivery of the "Ham Video" equipment to the ISS Columbus module by the European Space Agency further reflects the continued support that Amateur Radio provides for communicating with students. 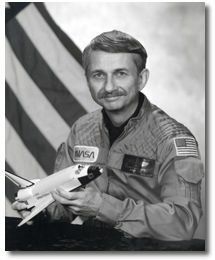 It all began with NASA Astronaut Owen Garriott, W5LFL, the first astronaut to communicate via ham radio from space during STS-9 in 1983. He will be featured on a multimedia panel as part of the Saturday banquet program, moderated by AMSAT Vice President for Human Space Flight Frank Bauer, KA3HDO. The presentation will include video highlights of Amateur Radio in space. J Allen, VY1JA, will end his radio silence this year and take part in the 2013 ARRL November Sweepstakes CW from Whitehorse, in Canada's Yukon Territory. He's also hoping to become more active in Amateur Radio again. VY1JA in Yukon Territory will be among the handful of SS stations handing out the rare NT multiplier. "Remember to watch for VY1JA on about 21.027 and 7.027. I will need your patience, because I have been essentially QRT the last 6 years," he said in a CQ-Contest reflector post. Allen said he'll only be available on 40 and 15 meters this year because those are the only two places his quarter-wave 40 meter ground place will operate. "I have no backup antenna, because bad weather shut me down," he told ARRL, adding that he's not planning to operate for the SS phone weekend. J says he's now running a Yaesu FT-990 and an Alpha 9500 amplifier (both with appropriate backups). He describes himself, "the operator," as "old and worn out but still breathing (no spare because they threw away the mold)." Down the road he hopes to complete the installation of a quarter-wave vertical for 80 and possibly a broadside pair of phased verticals directed at the US for SS. He reports that the verticals are in place, but he did not have time to trench his coax feed line, "and cold weather is here." So finding VY1JA on 80 meters this year "would take a miracle," he said. He also wants to set up a crank-up tilt-over tower with a multiband Yagi for the higher bands. He says he's done with climbing. J also is looking forward to doing some "weak signal" work on VHF and UHF as well as at the other end of the spectrum, 137 kHz. Then there's the hope of operating more RTTY contests and wrapping up WAS on 6 meters. "I just hope Jiminy Cricket was right about dreams coming true," he concluded. Scouting's largest worldwide event -- Jamboree on the Air (JOTA) -- takes to the airwaves this weekend (October 19-20) starting at 0000 local time Saturday to 2400 local time Sunday. Some 750,000 Scouts at 6000 stations in 150 countries around the world are expected to take part in this, the 56th Jamboree on the Air. JOTA provides an opportunity for members of the Boy Scouts of America to experience Amateur Radio firsthand, perhaps planting the seed for a lifetime of hamming. Not a contest, JOTA's goal is to foster Scout-to-Scout communication across borders. "The idea is to contact other Scout stations and allow as many Scouts as possible to talk to other Scouts and learn about who they are and what they are doing," the BSA says in its JOTA guidelines, which offer suggested frequencies. Veteran radio amateur mentors often open their stations to Scouts on JOTA weekend, serving as control operators. Radio operation will be on 80 through 6 meters and 2 meters and 70 centimeters FM simplex, all modes. Through its Radio Scouting sponsorship, Icom America is providing stations for JOTA and other Scouting events, including the loan of five stations that will be on the air for JOTA 2013. The Daily DX reports that PI4RAZ has set up a JOTA cluster site for participants to find JOTA activity. Team Lampedusa will be active as IG9Y from Lampedusa Island, Italy, starting October 17 and through the CQ World Wide SSB. "We would like to thank the amateur community and the sponsors for your generous support, and look forward to putting you in our log," said Team Lampedusa's Dale Long, N3BNA, on behalf of the group. The international contingent of operators will include HA1YA, JH5GHM, LZ1QN, N3BNA, PC5A, PE1ITR, S5ØX, S52RU, S57UN, S57DX, S59A, RCØF, RT4RO, and VE3LA. Lampedusa has been in the news recently as the site of the tragic fire aboard a ship that subsequently sank October 3 while carrying immigrants from North Africa to Europe. More than 350 people died when the vessel went down some 2600 feet from shore. Team Lampedusa has set up a PayPal account where individuals and groups can donate to address needs resulting from the tragedy. "We will do what we can," the group's statement said. "We hope that the amateur community will show its concern." All gifts will be acknowledged, and the group says 100 percent of donations will go to charity. Located between Malta and Tunisia, Lampedusa is Italy's southernmost island and is geographically part of the African continent. Recent solar activity took a healthy jump this week, with the average daily sunspot number increasing nearly 48 points to 126.9, a positive change of 60 percent compared to the previous week. Average daily solar flux was up 16.4 points to 126.5. The daily sunspot number rose to 148 on October 15, the highest it's been since August 21, when it was 149. Higher numbers prior to that were 161 on August 19 and 186, 212 and 198 on May 15-17. Average planetary A index was unchanged, at 8.1. The high latitude college A index indicated active geomagnetic conditions on October 14-15, when it was 31 and 27. The latest prediction shows solar flux at 125 on October 17-18, 120 on October 19-21, 110 on October 22-23, 105 on October 24, 100 on October 25-29, 105 on October 30-31, 100 on November 1-2, 110 on November 3-4, 115 on November 5, 120 on November 6-7, and 125 on November 8-12. Predicted planetary A index is 15 and 10 on October 17-18, 5 on October 19-20, 10 on October 21-22, 5 on October 23 through November 10, 12 on November 11, and 5 on November 12-16. Look for an updated forecast in Friday's bulletin and reports from readers. If you have anything to report, please send it to k7ra@arrl.net. In the article "On the Air: Pacific, Asia DX Operations Announced," in The ARRL Letter, October 10, 2013, we erroneously included the November-December 5V7TH operation in Togo, which is in Africa.